I want to welcome all C.T. English students and parents to a new year of learning and fun! My name is Cris Vaughan, and I am honored to be your new C.T. English Home and School Club (CTEHSC) President. I am relatively new to the mountain, having moved here from Cupertino about two years ago, but I already love the strong sense of community I feel here in the Loma Prieta Joint Union School District. 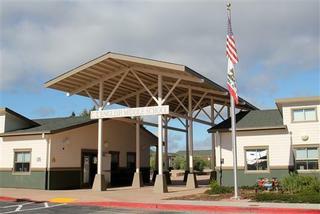 At our previous school, Stevens Creek Elementary, I was very active as PTO President and Chair of our Fall Festival. I learned a lot about how parent volunteering instills the importance of service in our children and how quickly volunteering connects us with the parent community around us. I have two daughters at C.T.E. - a 6th grader and an 8th grader, and every day I see how independent they are becoming as they grow into smart, beautiful young women. But I also see that I can still contribute to their growth and development by remaining active in their school lives. The CTEHSC enables us to be involved as we work to support and participate in school programs and events that directly benefit them. While no longer helping out in the classroom, or directly interacting with our children at school as much as we used to, we can still show them that we value their education (with teacher appreciation and grants, and science fair), their health (with Snack Shack, The Turkey Trot, and Sports Boosters), and that we continue to want them to have fun (with dances, games, movies, and skating)! All of these efforts rely on a dedicated parent community that is willing to volunteer time and energy, and I thank all of you who are involved. I know that many of you have work and other commitments that can make it difficult to volunteer at school, but now that your child is in middle school, this is a perfect time to volunteer as CTEHSC events generally require a smaller time commitment and often happen outside of work hours. So, I invite all of you (even dads!) to take this opportunity to show our children how important it is to give back to our community and to stay involved in their school lives. If you haven’t already turned in a Volunteer Interest Form, please do so now and become a part of the CTEHSC team! I enjoyed meeting many of you at the Root Beer Social, and I look forward to getting to know more of the C.T.E. parent community over the next few years! For all Snack Shack volunteers, there will be a mandatory kitchen training on September 5th at 9:30am in the shared portable meeting room (next to the kinder play yard). If you have a current California Food Handlers certification, please email a copy of it to Eileen Bevans in the district office. The first day of Snack Shack will be September 11th. All Snack Shack volunteers must have a current TB Test on file with the district. If you don’t have a TB Test on file, TB testing will be hosted (by the Loma HSC) at school on September 12th, with a follow up skin check on September 14th. You can also schedule an appointment for a TB test with a nurse at your doctor’s office. The first CTEHSC Board meeting will be held on September 13th at 8:30am in the shared portable meeting room (near the kinder play yard). All parents are welcome to attend. Are you interested in joining the CTEHSC Board? Please email Cris Vaughan. Our first Fun Night, Games, will be held on September 22nd from 7pm-9pm in the Gym. Admission is free for those who have purchased an All-Access Pass, or $10 at the door. All students must have a permission slip on file to participate in Fun Nights. If you would still like to purchase an all-access pass or if you need to fill out a permission form, you can do so at the check-in desk on the night. The Goodwill Truck Fundraiser last spring was a great success, raising almost $2100 for the Loma and C.T.E. Home and School Clubs! We would like to thank the whole mountain community for cleaning out their closets and storage spaces for our schools. Our next Goodwill Truck Fundraiser event will be on December 9th and 10th. Please mark your calendars and start collecting those unwanted items for donation! Adult Yoga: Clear focused mind, strong and flexible body, keep an open heart. Start your day with Liliya’s Yoga Flow. Graduate from Avalon Yoga Studio! Introducing new/old yoga style, various mudras and breathing techniques. Strong Core Vinyasa upon request. Monday 8:10am to 9:25am in the PE Portable starting on 9/11/17. $15/class drop in or $60 class package (6 classes for $10 each!). All funds are donated to the CTE Home and School Club. Bring your yoga mat, block, and towel. For more information email LiliyaGoldie or call 650-284-6341. Youth Yoga: Clear focused mind, strong and flexible body, keep an open heart. Introducing the Fundamentals of Yoga to the mountain kids: stretching techniques, breathing with various mudras and meditation. Monday 3:00 pm to 4:30 pm in the PE Portable starting on 9/11/17. $15/class drop in or $60 class package (6 classes for $10 each!). All funds are donated to the CTE Home and School Club. Bring your yoga mat, block, and towel. For more information email LiliyaGoldie or call 650-284-6341.